In the mid-nineteenth century, a style of bobbin lace commonly known as Chantilly achieved a great popularity that endured in varying degrees until the end of the century. The town of Chantilly produced lace for the French court in the eighteenth century, but ceased operations during the French Revolution. In the early nineteenth century, lace making slowly revived, but much of the production was made for export to the Spanish market. With the support of Napoleon III and the patronage of Empress Eugénie, lace production flourished again in the region, especially for the black laces made at Chantilly as they were considered to be the highest quality with the most beautiful designs. Detail showing the line of stitching connecting the upper and lower halves. Cooper-Hewitt has in its collection a French bobbin lace head covering – just one of many types of black lace accessories from the period. In an elongated diamond shape with scalloped edges, its design shows a symmetrical arrangement of flowers and sprigs emerging from a vase-like form. Made of grenadine, a black non-shiny silk thread, it has a ground or mesh that is comprised entirely of the twist-net Point de Lille. Symmetrical arrangements of flowers, sprigs and ribbons were the most popular motifs, and those are worked in an open half-stitch technique known as grillé that contrasts nicely with the open Lille ground. The motifs are outlined using a heavier untwisted cordonnet that give further clarity to the design. 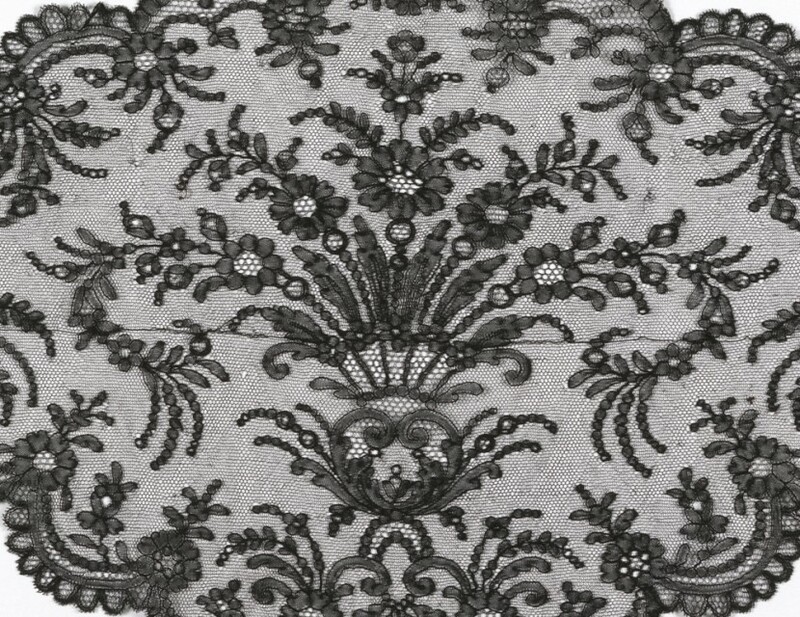 In response to the increased demand for larger fashion accessories such as shawls and flounces, lace workers adopted the Brussels technique, meaning that lace was produced in sections by several workers and were later pieced together. The stitch used to join the sections together is known as Point de Raccroc, and often times the stitch work could be very nearly invisible. In Cooper-Hewitt’s example, a clearly visible line of thread links the upper and lower halves together, showing how quality and production methods could vary across the region. Head covering, mid-19th century, Gift of Mrs. Rufus King, 1957-120-10.